On a moonlit winter night, a team of dogs pulls a sled, taking the narrator and readers on a wondrous ride through the snow, into and out of the woods. It is a ride you'll wish would never end. Through this exquisite prose poem, Gary Paulsen shares the joy, the beauty, and the grandeur of the outdoors. With his joyous text and Ruth Wright Paulsen's exuberant and expressive illustrations, Dogteam is a celebration of nature, a dance that invites everyone to join in. 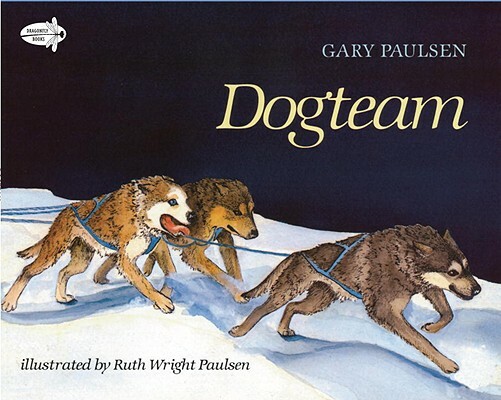 Gary Paulsen and painter Ruth Wright Paulsen have collaborated on many distinguished picture books, including Dogteam. "The energy and movement of the piece pull the reader right along through the entire race through the magical time and space to the homeward finish." "The book recreates an experience unusual in picture books."